Landscaping definitely needs to be approached with professionalism and expert knowledge in the field but that doesn’t mean it can’t be fun and exciting! Paul Gibbons Landscapes will work alongside their clients forming creative and versatile landscaping ideas for their property and then get to work transforming their garden or driveway. They truly believe that any exterior part of a property can be transformed into a relaxing retreat with clever landscaping and planting. 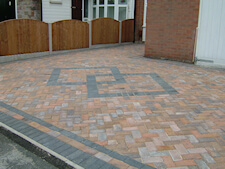 Skilled in using a variety of products to fulfil the needs of the customer, from Indian stone to block paving. Let’s be honest old driveways can look dirty, dull and boring. 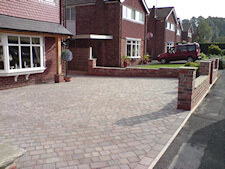 The good news is, that doesn’t have to be the case, with new driveways in Congleton created by Paul Gibbons Landscapes. 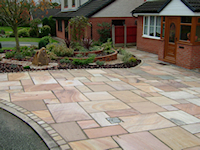 Beautiful new driveways can be created and old ones transformed. Many customers find that they are amazed with the fresh and aesthetically pleasing look when Paul Gibbons installs new driveways in Congleton. The diversity and new look that paving can create in a garden can be exciting. New spaces can be created in your garden or yard with classic or contemporary paving. Paul Gibbons Landscapes are highly experienced in installing all types of paving in Congleton as well as other areas across Cheshire. Paul Gibbons Landscapes photo gallery shows the high quality and professionalism they apply to every project when they install new paving in Congleton. Most properties require some sort of fencing, whether it’s to keep the dog in, or keep dogs out, for privacy, or for security purposes. Paul Gibbons landscapes source and install fencing in Congleton. As diverse as the reasons are for having fencing so can be the size of fencing projects along with the different types of material. Paul Gibbons Landscapes guarantee affordable and reasonable prices for all their fencing in Congleton that they carry out.